TWP has formed a community choir, Tota Voces, which is Latin for "Whole Voices." 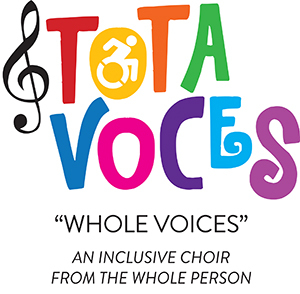 Tota Voces, or “Whole Voices” is an inclusive choir from The Whole Person created specifically for individuals with disabilities to have a place to express themselves musically. All are welcome, including friends, family, and advocates of the disability community. 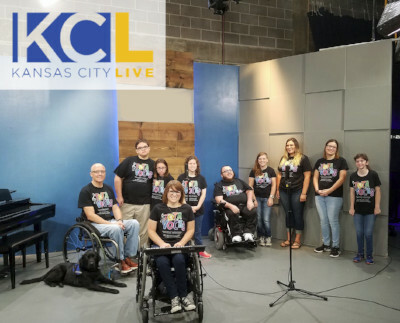 We aim to come together as one in order to learn, grow, and perform vocally for the Kansas City area. The Tota Voces Choir is open to all people 12 years and up, but geared to those with disabilities, and is directed by Heather Schouten. Rehearsals dates are listed at the bottom of this page. Contact Heather for specific details about rehearsals. CLICK HERE to join the Tota Voces (Whole Voices) Choir! Contact Terri Goddard, The Whole Person's Resource Development Manager, for media and interview requests or additional information: tgoddard@thewholeperson.org; 816-627-2220. KC Star Article excerpt: Begun in April 2017, this tiny choral group — known as Tota Voces, loosely translated as Whole Voices — is hers (volunteer director Heather Schouten) to lead, although the idea to start the choir was that of Terri Goddard, The Whole Person’s Manager of Resource Development and Community Outreach. 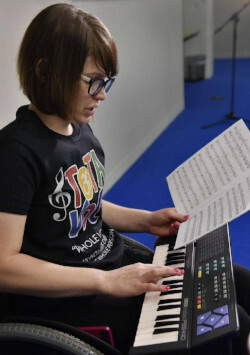 Goddard said the notion of the choir came to her after watching numerous other local choirs and noticing how there always seems to be one or two individuals in any single choir who are in a wheelchair or have some other disability. It dawned on her that the problem isn’t that people with disabilities are excluded, but they are not being purposefully recruited. “I thought that is what’s missing,” Goddard said. 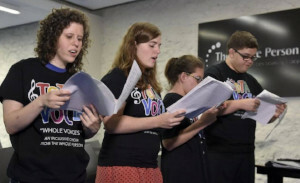 “Maybe we should start something that intentionally invites people with disabilities to be involved.” Goddard said her hope is for what she calls Whole Person’s “ability choir” to grow to the point where it includes a large mixture of people with disabilities as well as those without, including parents or guardians, brothers, sisters, friends and others. All are invited to join. Read the FULL KC STAR story on the Tota Voces Choir HERE. About Heather: Heather Schouten was in a car accident and she sustained a spinal cord injury between T1/T2 when she was 4 years old. As a result of the injury, Heather has paraplegia. She has been an instrumentalist, playing piano since age four and violin since age ten. She avoided voice because she was told growing up that, because of her disability, she would never be able to sing properly. In college she fell in love with choral music, studied Vocal Music Education, and graduated with a Bachelor’s in General Music Performance. She continued her education and is now one semester away from finishing a Master’s in Choral Conducting. During the day she is the receptionist for Numotion, a mobility products and services (including manual and power wheelchairs) company in Kansas City. Outside the office, Heather is currently the Interim Director for the Show Me Sound Chorus, a women’s barbershop chorus in Sedalia, MO, and is the Assistant Director for the Kansas City Chorus, a women’s barbershop chorus in Kansas City. She also teaches private music lessons and performs gigs around Kansas City when possible.